Jasper Johns: A Retrospective, The Museum of Modern Art, New York, 1996, no. 115. "Jasper Johns: A Retrospective", The Museum of Modern Art, New York; Museum Ludwig, Cologne; Museum of Contemporary Art, Tokyo, 1996-1997, no. 115. A Century of Drawing, National Gallery of Art, Washington, 2001-2002, no. 110. Jasper Johns: Numbers, The Cleveland Museum of Art, 2003-2004, no. 17. NGA Johns Drawings 1990, 23 (illus.). Jasper Johns: A Retrospective. Exh. cat. The Museum of Modern Art, New York, 1996: ,no.115. A Century of Drawing. Exh. cat. National Gallery of Art, Washington, 2001-2002: no. 110. 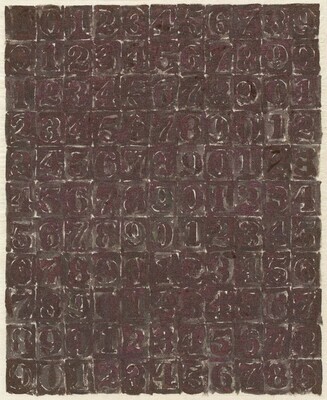 Jasper Johns: Numbers. Exh. cat. The Cleveland Museum of Art, 2003: no. 17.